Hmmm could this be better than the sassy decoder? One thing I like about their sassy decoder is free sat. It works like strong decoder, can use it to track free on air channels. Am currently using it to watch NIGCOMSAT. Okay . Still waiting for them. 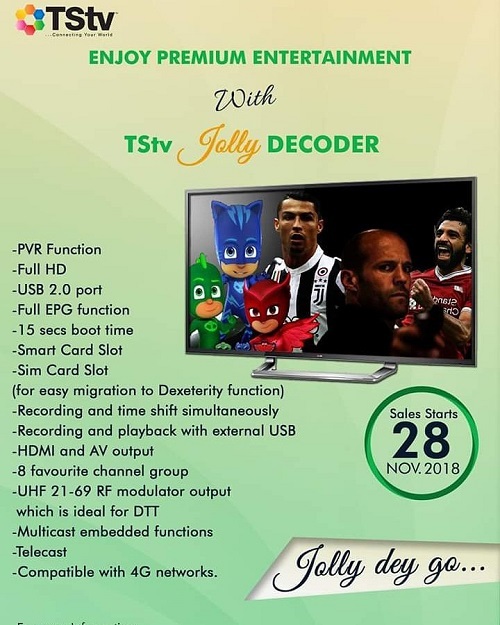 We do like homegrown competition for the DSTV but I do not envy those that have bought the sassy decoder then, this TsTv is always vanishing and changing satellites it is not ideal for trust as what guarantee is there that it won’t be just the same as always? I wish Tstv well, but they can never be a competitor to Multichoice. They really do not have a feasible plan. So much people have lost the trust they had foe them. Wish them all the best though…. Until they balance, am not looking their way coz like fowl, they still stand on one leg. This people should stop making public their plans, posting their schedule on their social media handles is the thing that as caused them so much damages. watin go happen if they just kukuma keep quiet, do their thing, launch whatever they want to launch and them broadcast it when they have finish ? That’s a nice one. But let’s keep our hope shallow so that we won’t be disappointed the way we were last time..
Are You Expecting Tecno L9 & L9 Plus?